"Great location, clean rooms, and friendly staff"
Have a question for Miracle House? "Miricle house is in a perfect location"
"Cleaning staff are the best, always smiling." "Very polite and helpful service with a smile." Ideally situated in an excellent area, this 10-bedroom house in Central Pattaya, Pattaya will be a perfect choice for your upcoming trip. This Pattaya house is close to Tony's Gym, International Gym, Golden Gym, Kiattikhun Thai Massage School, and K Driving School. With safety deposit boxes and a smoking area, it provides various convenient features to make your stay more comfortable. It has four floors and 10 bedrooms. This house offers a bar, enabling you to grab a drink before stepping out for a night out. If you want to spend the day relaxing and unwinding, get a massage nearby. There's free Wi-Fi available in all rooms, as well as Wi-Fi in common areas, enabling you to stay connected to the network without splashing out on international charges. This Pattaya house has air conditioning, free bottled water, satellite or cable channels, and an in-room safe box. It also has a shower, a coffee or tea maker, a desk, a fan, and other amenities. It provides a variety of useful services, such as daily housekeeping and luggage storage. This Pattaya house offers check-in from 02:00 PM and check-out until 12:00 PM. Pattaya Railway Station is 3.0 km away and Bus Terminal is 3.1 km away. The nearest airports are Utapao International Airport (UTP) and Suvarnabhumi International Airport (BKK), which are 29.5 km and 86.1 km away. Friendly staff, clean room, soft bed, decent A/C. There is no lift. Some noise from the Chinese bus tours parking at The Vogue but only for a short time in the morning and early evening. Otherwise, a quiet location close to the action. Perfect location, just behind Retox at the bottom end of Soi Lengkee. Some noise from tour coaches transporting guests from Vogue Hotel opposite but, nothing too major and only for short periods of time in the morning and evening. Staff very friendly and rooms were well cleaned and spotless. Would recommend and would stay again. I enjoyed my stay here, staff very helpful, location is great, right in the thick of things but hotel is tucked away so very peaceful. The room was very comfy and clean, like 99% of guest houses it has many stairs if you're on a higher level but that's ok.
Super new, modern and clean, good location and very friendly staff! Great place to stay! I was suppose to stay five nights at Miracle House but booked another five! Really good location, brand new, fresh, super clean, modern, very comfi! Downstairs massage, upstairs the rooms. This place is part of a new build complex. I checked other cheaper rooms in the same complex, but not nearly as nice as the rooms at Miracle House. So much worth spending the extra 100/200 baht! The staff is very friendly and helpfull! Opposite Miracle House is the Vogue Hotel. In the evening buses full with tourists arrive at this hotel. Quite a bit of noice but quiet during the night. located on the square facing Vogue hotel. No elevator. Ive stayed here many times because of the staff Ae & Noi. There nice ladys you can trust ,that means allot to me. Located at the end of Lengkee close 3rd road. Sound far away but isn't. Booked for 2 days but extended to 5- always a good sign. Sparkling room, Properly appointed. Comfortable bed. WIFI- worked excellent with only 2 short drop outs in 5 days. Position qithin 5 mins walk LK Metro. 7 mins to Mikes Mall.Easy to get to most of the action. Walking street a bit too far to walk but a 60bt motorcycle lift each way. I would stay again, its a good choice.Underrated. Room was cleaned daily including change of bedding. This was done to a very high standard. Room had kettle, fridge and security box which can all be lacking in a room of this price. Hotel staff very friendly and a credit to owners. Great accomodation, especially considering price. Very clean with delightful staff ladies. Good location on Lengkee, just off Buakhao and near LK Metro street. No need to venture much further for nightlife. Really no complaints. Will use again. Very friendly staff. Many stairs. Nicely decorated room with comfy bed and just one hard little chair and desk. TV and wi-fi works good. No restaurant, but plenty nearby. Location good near many bar-, massage- and restaurant streets. Close to LK-complex. Would gladly return for a coupple of days. I had a very enjoyable stay here close to bars and restaurants not to far from the shopping malls and very friendly and excellent staff all in all a great place to stay and I will be going back there next time im in Pattaya. This is a small family-run guesthouse with friendly staff, and a pukka massage business downstairs. It is in a new building in a fairly quiet soi off Soi Lengkee. Pluses: All furniture and fittings are nearly new; good TV with fair range of channels; fridge, excellent fast wireless internet; good value traditional Thai massage downstairs (200 baht); run by nice family with friendly staff; no food but close to affordable local restaurants and bars; good kingsize bed; in-room safe; good security with electronic lock on access door. 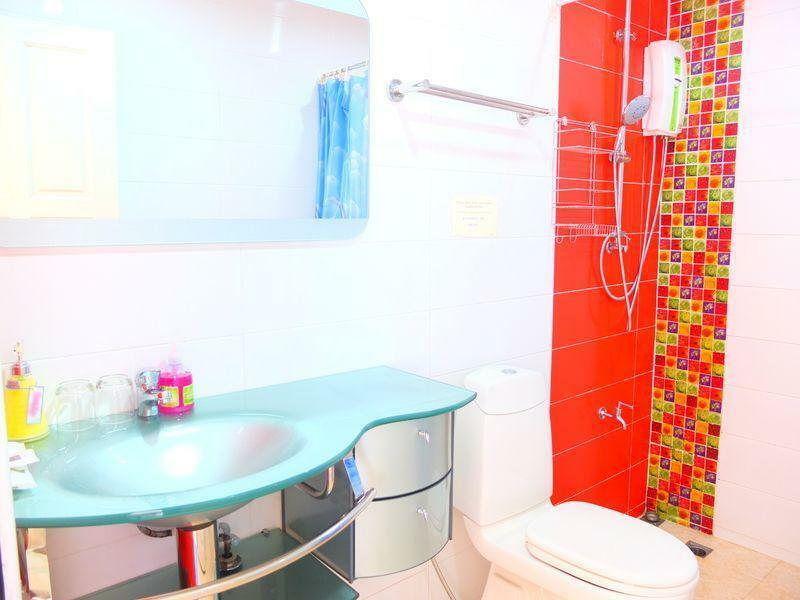 Limitations: room is rather small; although good the bathroom has a Thai-style shower so that floor gets wet; staircase is rather narrow; no BPL football on the TV (no CTH only GMM). Overall this guesthouse provides excellent value, and room is big enough for a single traveller. The staff are very friendly and the girls know how to give a genuine Thai traditional massage (not like the naughty massage parlours around the corner). The hotel is in a generally quiet Soi, but there is some noise from the adjacent Vogue hotel car park from about 7.00 am. There are many bars and eating places in the local area. Had a lovely stay at Miracle House. All furnishings are new, TV was the best quality, picture and range of channels I've experienced in Thailand. Staff were lovely and very helpful. It was a bit hard to find at first as the guesthouse does not face onto Soi Lengkee but is located behind the soi. Very close major bar and club area LK Metro. The one and only issue I had with the guesthouse was the parking attendant at the major hotel/resort facing Miracle House. About 12 or so buses park directly between Miracle House and this hotel/resort and need to directions getting in and out of the confined space. The young man directing the parking used his whistle to direct the staff, using it frequently and very loudly from about 7:00 AM each morning. So if you're an early riser, you'll be fine..... but if you're out on the town till the wee hours, be prepared for an early wake-up. I really enjoyed my stay at Miracle House because of the friendly staff & warm hospitality that they provided. My room was always clean with fresh towels. Water was provide on a daily basis & complimentary wi-fi which is a must today was also included. I would like to mention the very professional attention given to me by Miracle House staff member Apple. She definitely made my stay a pleasurable one. The only improvement I would recommend to Miracle House would be to install a credit card reader so customers can make payment for extended stay by credit card. In closing, I would not hesitate to recommend Miracle House to any of my colleagues traveling to Pattaya.